This picture postcard was sent from Betheny Aviation in the Marne. at a race track on Betheny Plain outside of Reims. This was the first French show of a number of such shows of pioneer aviation. The sender was probably one of the several hundred thousand visitors. which Blériot had crossed the English Channel hardly a month before on July 25, 1909. The card is franked with a 1906 10 c. red Sower Type II (Scott 162). 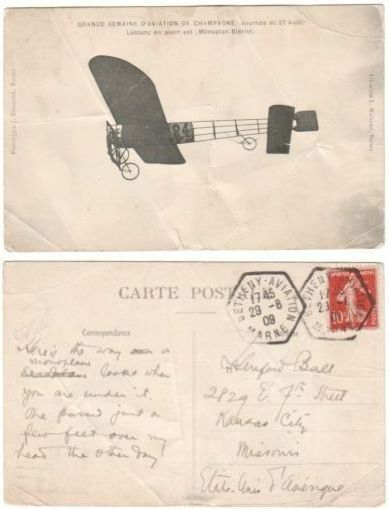 There are two of the hexagonal Betheny Aviation | Marne datestamps. This had to be another thrill from those magnificent men and their flying machines. The destination of the cover was Kansas City, Missouri, in mid-America. I'm not sure but the addressee appears to be Hereford Ball.